I was introduced to Kayu Design by way of Moda Operandi several months back and immediately fell in love. They carry the most adorable bags on the planet! From shell-shaped to turquoise-adorned, every style is feminine and fun. Remember the raffia clutch with bows that I posted about weeks ago? Also by Kayu. I was elated when the Kayu team reached out about doing a giveaway for my readers! 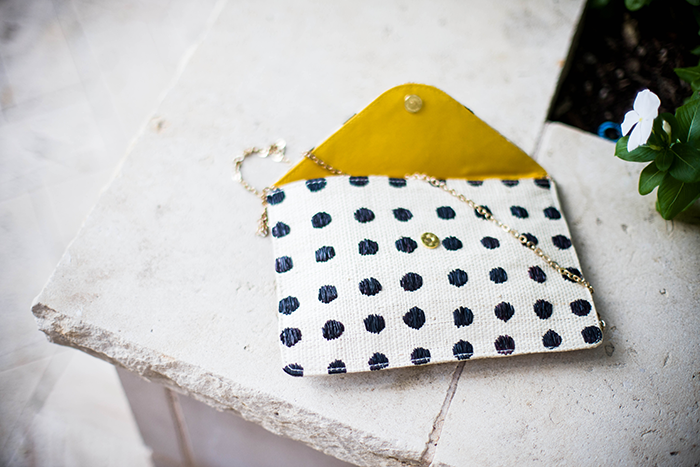 My favorite style is the Baha Straw clutch with black polka dots – it’s a classic shape and color combo, with a girly print to boot (aka my kind of clutch), so that’s what I decided on for the giveaway. All you have to do to enter is follow myself and Kayu Design on Pinterest using the widget below – super easy! Good luck! 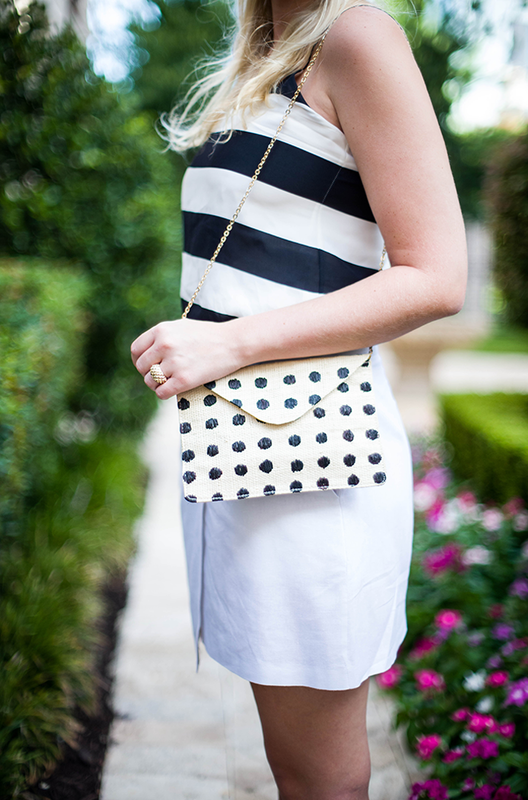 Love this fresh look, this little bag is so cute and adore the KW sunnies. Absolutely adore this little bag! And love the simply chic and somewhat nautical outfit today! 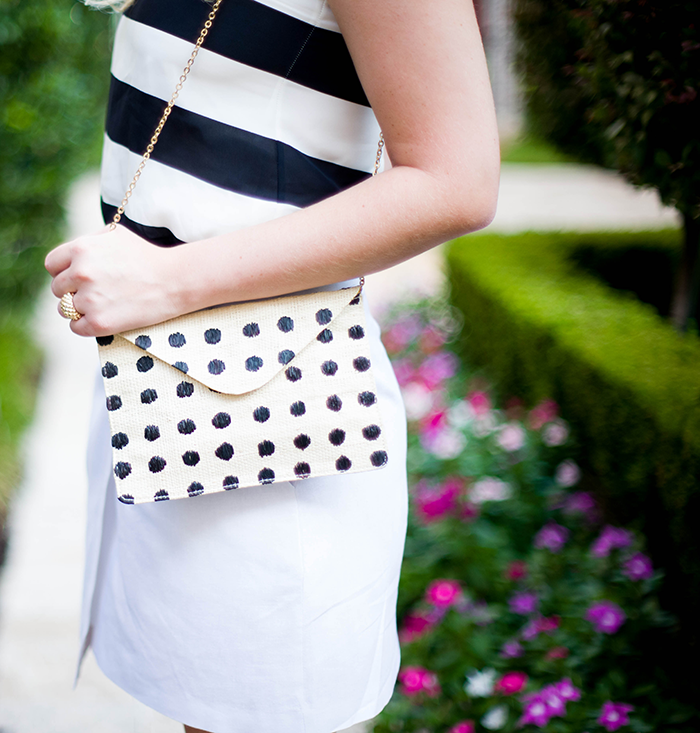 Love this B/W look and that bag is precious! LOVE your hair like this— it looks so cute! This bag is adorable– fingers crossed! Navy and white is always so crisp and fresh for summer! That clutch is adorable! Love the cami – got one very similar from j.crew factory. I’m all about navy/white stripes. Love the outfit! i’m sorry i cannot participate, i still don’t have a pinterest account. you look so beautiful, it’s the perfect fresh summery look! i love all white outfits. Cure outfit, i love the mix of polka dots and stripes! PS, Thanks for the giveaway! Those bags are all so perfect…also, love your hair like this! Entered! Thanks for hosting such a fun giveaway, Merritt! PS- You look super cute in these pictures. 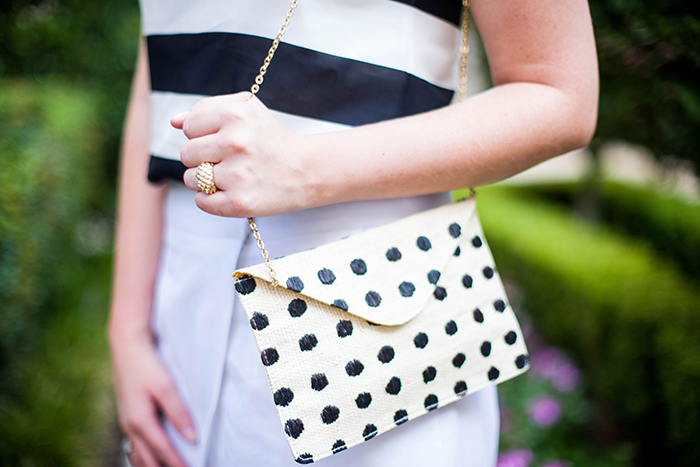 Stripes and polkadots are my favorite combination after all!